As the 2014 Bank of America Chicago Marathon steps to the line this Sunday morning, we go back to the event’s early years when Welshman Steve Jones brought marathoning into the spotlight along Lake Michigan with his 2:08:05 world record. In those days, the sport was still heavily centered around the Boston – New York City axis. The London Marathon had only been around for four years, and the Los Angeles Marathon was still two years from its beginning. Bringing world-class competition beyond its East Coast roots was a major accomplishments, and an important factor in helping grow interest in the sport. Jonesy’s stellar run in Chicago `84 also represented another turning point in the game. It marked the last time the men’s marathon world record would be set without the aid of pacesetters. This Sunday Steve Jones will once again be in Chicago to commemorate his record run, and celebrate its 30th anniversary. Here, then, is the contemporaneous race report from Chicago 1984, a day to remember in the annals of marathoning history. Chicago, IL. — And then there was the weather, forty-four degrees with a wind-driven rain like an icy finger tracing the back of your neck. Over 10,000 huddled runners jittered anxiously at the dual starting lines on Clark and Dearborn Streets for the 8:45 a.m. signal to begin the eighth America’s Marathon/Chicago (as it was known in those days). On the front row stood some of the best marathoners in the world. “It’s the Olympics all over again”, said one punter as champions from every continent pawed the ground, anxious to be off on their heat-generating journey to Lincoln Park. This was no place for the skittish, rather an end-of-the-season, post-Olympic blowout engineered by Beatrice Foods sponsorship money and Bob Bright orchestration. “The Games are over. We’ve nothing to lose. So let’s have a go,” was how Welshman Steve Jones prophetically put it the day before. Into the wind for the first two miles, yet the clock still read sub-fives at 9:58. Then the key stretch as the course looped onto Michigan Avenue and then north along Lake Shore Drive, six miles with the wind tailing. Timidity and caution took up together well off the pace. 29:54 was all it took from miles three to nine, 4:48 pace. Kenyans aplenty: Richard Keitany, Gabriel Kamau, Simeon Kigen, and defending champion Joe Nzau. They joined Steve Jones, eighth at the Olympic 10,000m final in L.A., Boston champion Geoff Smith, along with South Africa’s Ewalt Bonzet and Mexico’s young Martin Pitayo for some urban intensity against the name brands, 1983 World Marathon Champion Rob deCastella of Australia and new Olympic champion Carlos Lopes of Portugal. Ten in all, rolling, as $250,000 in “Athletic Funds” waited at the finish line. Quickly it became obvious that hard-paced attrition would define the issue. The come-from-behind types would have to find another race on another day. Behind the lead pack a widening black hole yawned, ready to swallow any who faltered. Mostly it was Deek at the point along with Nzau, who came in off-form from a 2:14 marathon effort just three weeks before. Keitany, track coach at Iowa State, and Geoff Smith also showed in front as the rain abetted but the wind pushed them along four, five, even six abreast, slender figures set against an urban tapestry. Only Lopes, Bonzet and Pitayo remained off the front row throughout. As they blew past White Sox Park at 35th and La Salle Streets, the course looped back into the wind for miles ten through twelve. 5:06, 5:06, 5:01. But the wild card that the weather always is in marathoning flipped over strong on the side of the runners from that point forward. As the wind subsided, the rain stopped and Chicagoans cheered, the marathoners upped the tempo. At fourteen miles, Nzau gave up the charade, and fell into the abyss. Later he hopped a ride on the women’s lead vehicle. At sixteen, Kaitany could no longer hang on, Kigen, too, once a favorite, but peaked two weeks too early and now saddled with a virus and gone. Then Bonzet, as one by one they were tapped of vitality, becoming pressure-popped machinery running half-spirited, marathon adventurers out for fame and fortune living too long the draining fringes of 2:08 pace. Down to six. 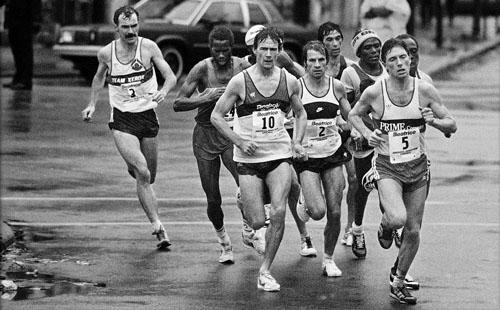 Deek, the 1983 World Champion had come to Chicago to “reestablish” himself after a disappointing fifth place finish in the Olympic Marathon in Los Angeles. Smith, the high-kneed frontrunner, right there with his distinctive cheeks-puffing style. In row two Jones floated on a cloud of comfort, hardly out for more than a Sunday morning long run. Kamau alongside ran resolute, head down, well-raced coming in, and ready for a good one. Young Pitayo of Mexico had only one marathon behind him, and that a 2:16, but was he in the process of shaping a breakthrough? And Lopes, the Olympic champion, in Chicago playing with house money, but answering questions about his motivation with each effortless stride as he lurked dangerously in striking position. Just past 30Km at an ill-place aid station on the corner of Larrabee and Webster Streets, Smith clipped Kamau’s heel. Bang! Kamau was down! Hard! Jones kept Smith from falling as the pack’s valence factor disappeared in an instant. Fatigue had become a seventh presence in the group. Pack running had now become too dangerous. All concentration was recalled to pull internal monitoring duty. As sure as a sign from heaven, the time for winning was at hand. Five weeks of altitude training in Park City, Utah along with three highly successful pre-marathon races in San Francisco, Dayton, and El Paso, Texas had Jonesey’s confidence blooming. Inexperience at the marathon distance – he’d only started one before, `83 Chicago where he stepped in a pothole at sixteen miles and was forced to drop out – became a paradoxical advantage. He had no fear. After the Kamau fall Jonesy eased to the front, itching to raise the stakes and turn his hole card. Three furtive, chin-to-chest glances to gauge a response — “who wants to play?” — and his hesitancy could no longer be contained. With a resolve born of his Welsh coal-mining heritage the wraps came off, the card turned, and he pushed every chip into the pot. 4:47, 4:42, 4:47, 4:41. Only Kamau, still awash in the adrenal residue of his fall, attempted to match strides with the RAF jet mechanic. But his would only be a short burn, and by 22 miles both Deek and Lopes had reeled Kamua in for a stand-up battle for second. Kamau, Pitayo and Smith accordioned behind, retreating into the positive-thoughts caverns of their own yet-to-be-determined fates. Jones never looked back once. His final mile evaporated in 4:45. His final 10k lasted a paltry 29:38 (4:46 pace). 2:08:05 registered the finish line clock. 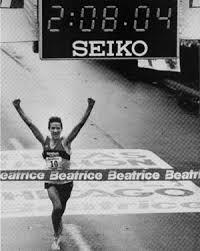 New world record, bettering Deek’s mark from Fukuoka 1981 by thirteen seconds! Lopes kicked by a grim-faced deCastella in the final 200 meters to take second by three seconds in 2:09:06. Little consolation for Deek that his was the fastest third place finish in marathon history. 2:09:09 for Kamau in fourh, with Smith and Pitayo rounding out the top six. Rosa Mota of Portugal followed her Olympic bronze in LA with a relatively easy victory in the women’s race, posting a PR 2:26:01. Australia’s Lisa Martin picked off Norway’s Ingrid Kristiansen for second in a PR 2:27:40. Thousands more wrote their own stories October 21, 1984. And, as if to signify its approval of America’s Marathon/Chicago 1984, shortly after noon the sun blinked its way through the clouds as if to crown the proud city The Best of the Best. can walk outside to the patio, or inside near a sunny window and harvest lemons and limes year-round. any party that celebrates the beginning of the cooking process. have garden real trouble with. Once I have all the water cress – if it lasts its first few weeks – will produce seed. Thanks for the trip down memory lane, Toni…. I had been the so-called celebrity race public spokesperson for the first edition of the “new” America’s Marathon Chicago back in 1982 and watched as Bob Bright (with Beatrice Foods $$$) brought the world spotlight onto this once regional class race and made it truly world class with a star studded field from around the globe. I announced this race on the radio for WMAQ-AM in 1984 and it was quite exciting. Steve had done pretty well at the Olympic Games 10K just a couple months earlier and had done even better training since LA. You’re absolutely right… this was back in the day when the competitive field set the race pace… not a rabbit(s). It was certainly a race that I will always remember. Not sure that there wasn’t a problem with the WR status afterwards due to certification issues… most all of the major races back then were slow to conform to the new requirements imposed by TAC/IAAF for approved/sanctioned road racing records. I forgot how challenging the weather was early on as I was sitting under the radio broadcast tent near the finish line. Steve put on a helluva show! Really, Carlos Lopes did, too…. considering he was in his late 30’s… almost unheard of then. Set a PR that day…. 2:40…. but little did all of us know trailing Steve Jones, what he was about to do. All of Chicago was proud of him and the guts he showed. BTW…couple of years later, Chicago Marathon was cancelled for lack of sponsorship…but they held a 1/2 marathon. Jones won that also…and you and I shared a couple of beers after the race just hanging out. I think you owe me one! I was near a CBS TV truck at mile 20 and peered inside to see the 20 mile split on the TV monitor. Phil Rogers, the late local news reporter, was standing next to me. “They’re on world record pace!” I told Rogers. “You are sure?” he asked. He suddenly went live and reported what I had just told him. Seeing Deek and Lopes get hammered by Jones that day, it was quite a sight to see. One of my favorite running memories. I watched Jonesy from the pace car for all but the last 200 meters when we turned off. Stunning performance. My voice, literally, has never been the same for screaming the last miles of the race. Hard to believe it was so long ago. Vivid to this day. Awesome re-hashing of an incredible race! Thank you, Toni!!! Toni- Terrific stuff!! I also remember that day very well, when Steve went back to his hotel room and the BBC was on the phone already wanting to talk to him. A British WR holder!! Annette Jones was there and in her normal calm way handling things like he had just received a little bonus on his RAF check!! No one tougher on the road than Steve Jones!! Goosebumps, Toni, goosebumps. I remembered the race, but not the details until now. Now I want to watch it again. Is the video on YouTube?